Already a river runs through it; but by 2015, when the Pan-Am Games begin, there’ll be a lot more than that to go with the flow. We’re talking about the West Don Lands, of course, soon to be known as the site of the Athletes’ Village, which for several weeks will be home to more than 10,000 competitors. 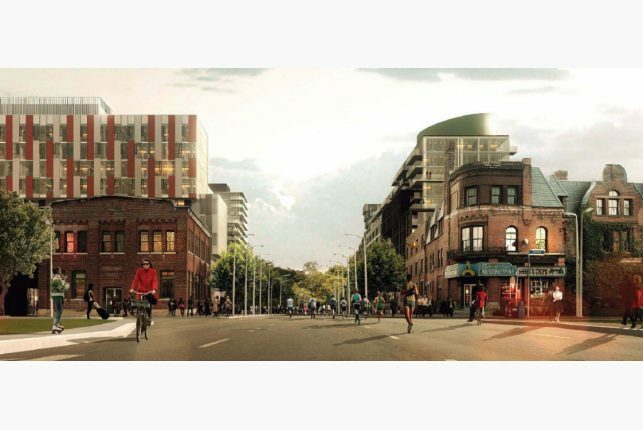 Located just west of the Don, south of King St., the complex will eventually become a mixed-use neighbourhood complete with parks, shops, affordable housing and student residences, as well as several thousand condo units. “Everyone will benefit,” Ontario Citizenship Minister Charles Sousa declared yesterday at a news conference called to reveal details of the multi-billion-dollar scheme. Though few details were actually available to the media hordes gathered for the occasion, Sousa could well be right. And if he is, it will be because of the work done by Waterfront Toronto over the past decade. Basically, WT has spent years planning various precincts along the waterfront. That means clarity — by the time developers show up, they know what the rules are in terms of what they can build. The advent of the Pan-Am Games will speed the process up by five years, but the real issue is whether the market can absorb so many new condos. Clearly, Tanenbaum and his partners think it can. The design team behind the winning scheme includes architectural luminaries Bruce Kuwabara, Peter Clewes and Renee Daoust of Montreal. All are members of the WT Design Review Panel and familiar with the issues of waterfront redevelopment. The Village comprises a series of midrise buildings organized along Front St. east of Cherry. A large L-shaped structure open to the southwest creates a large square at the corner of Front and Cherry, across the road from the landmark Canary restaurant. Beyond that, low-slung buildings huddle around open courtyards. 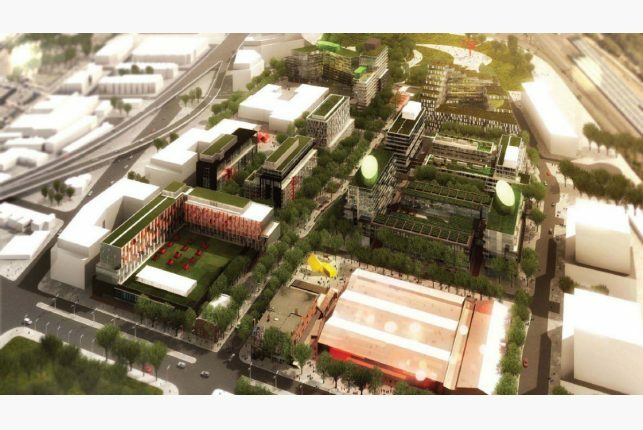 Plans also call for Front to be turned into a promenade that will lead all the way from Union Station to Don River Park, now under construction just east of the Athletes’ Village. To avoid the deadly homogeneity of most such mega-projects, each block will be designed by a different architect. “We didn’t want to make it look like so many loaves of bread,” Kuwabara explains. Though Mayor Rob Ford was conspicuous in his absence, his failure to appear underlined not only his poor judgment but also the fiction that is civic politics in Canada. In truth, this is a provincial project. Ottawa contributed minimally, Toronto not at all. There are good reasons to worry about this sort of high-speed city-building exercise. But keep in mind that, although much remains, the hard work has been done. The heavy equipment has only just arrived, but the heavy lifting is over.